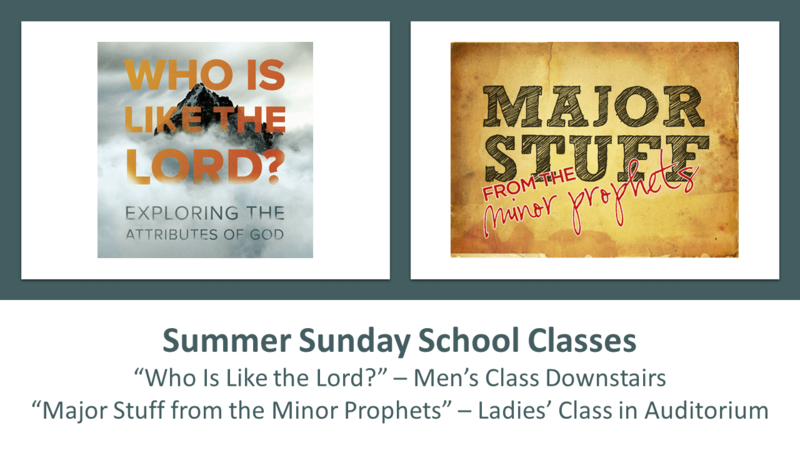 We’ve got brand new Sunday School classes starting this Sunday, July 3rd, at 9am, and you don’t want to miss them! For the Men: “Who is like the Lord?” — a study of the attributes of God. This class will meet in the Media Room downstairs. A bunch of different men are helping with this class, including Kenneth Caldwell, Keith Oliver, Dan Callaway, Norm Duchane, Jeff Kuhns, Randy Fuqua, Charlie Dauphin, James Hinkle, John Gabriel, Bill Surratt, and Fritz Stampfli. For the Ladies: “Major Stuff from the Minor Prophets.” The ladies will meet in the auditorium and study a few of the minor prophets: Hosea, Joel, Jonah, Nahum, Habakkuk, and Malachi. Several different women will be teaching, including Harriett Hinkle, Leslie Hiatt, Sandy Petty, Pam Duchane, Brittany Callaway, Kathy Gabriel, Destiny Gabriel, and Leighann Jack. I think you’re really going to enjoy and learn a lot in this class! Now’s a great time to get back into the habit of Sunday School. It’s a great time to learn Scripture and get to know your brothers and sisters!